A throwback to the original Wolfman movies with a new-found taste for violence. Made for fans of the franchise and fans of “bloody-as-hell” movies. There is only one thing you need to know going into The Wolfman: it is not made like a modern movie – it is made to look and feel exactly like the ones from the the 1930s. The story is extremely simple, the major Wolfman effects are (mostly) make-up – not relying fully on CG effects – and it’s got a classic, over-exaggerated score. If this is what you expect upon going into The Wolfman, then you will enjoy it. If you’re expecting anything else, you’ll likely walk away disappointed. It’s 1891. Gwen Conliffe (Emily Blunt, The Devil Wears Prada) cannot find her fiancee. He’s gone missing. Asking for help, Gwen writes a letter to her fiancee’s brother, Lawrence Talbot (Benicio Del Toro, Traffic), who quickly returns home to Blackmoor, England. By the time he arrives, his brother’s body is found mangled on the side of a road – presumably torn apart by a wild beast. The suspicious townsfolk accuse the local pack of gypsies that reside in the woods. During a raid of their camp by the local police, a wolf-like beast shows up and starts violently killing everyone in sight. 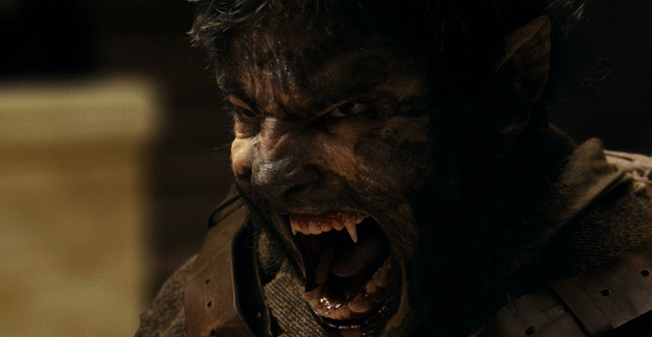 During the scuffle, Lawrence is bitten by the beast, causing him to turn into a Wolfman. As the legend tells, every full moon he uncontrollably turns into a half-wolf, half-man monster and can only be killed by silver bullets. There’s no real plot to The Wolfman after that. As you can tell from the trailers, there’s a dark Talbot family secret held by Lawrence’s father (Anthony Hopkins) and he gets captured by a group of scientists who think they can cure him of his “mental disease.” Considering the lack of plot throughout the whole film, there end is congested by too much plot. Hopkins’ character becomes inconsistent and erratic in actions and leads to an unfitting finale. The stories between Lawrence and Gwen and Lawrence and the Scotland Yard inspector (Hugo Weaving, The Matrix) are far more interesting and entertaining that the one that unexpectedly develops. But even with the film in it’s current state, it’s still a good, fun, excessively violent time. Is it a good movie? Maybe. Is it a good Wolfman movie? Yes. If you know what you’re getting into before you get into it, I’m sure you’ll have a great time.